A quick guide to Bizet's fiery masterpiece. The beautiful gypsy Carmen warns any man who loves her to beware. But she does not anticipate the furious passion that she will unleash when she seduces Don José, a corporal with the army in Seville. Francesca Zambello’s production, with warm terracotta-painted sets and traditional Spanish costumes by Tanya McCallin, brings 19th-century Seville to life in all its bustle, heat and excitement. Striking dramatic scenes include the fierce fight between Carmen and one of her fellow workers in Act I, the performance of the flamenco-dancing gypsies and Escamillo’s entrance on horseback in Act II and the grand religious procession at the start of Act IV as Escamillo prepares to enter the bullring. 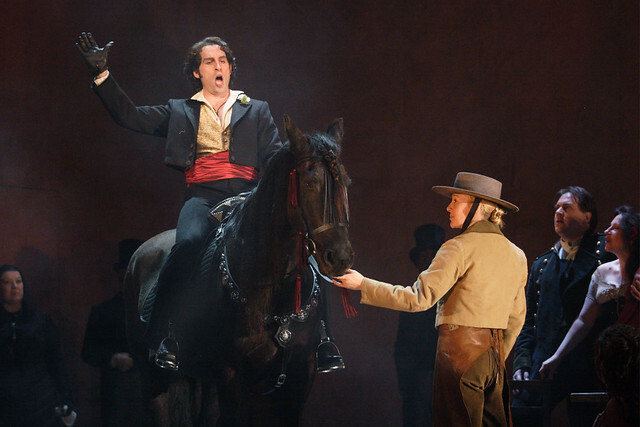 Much of Bizet’s score for Carmen has a Hispanic flavour, above all in Carmen's arias. Three of her four arias are inspired by Spanish dance rhythms, and the first, the ‘Habanera’, uses a 19th-century Spanish melody. Bizet also uses memorable motifs in his score, including one representing fate, first heard in the overture, which as it returns comes to signify the tormented and tragic passion of Don José for Carmen. Bizet took the plot of Carmen from the novella of the same name by the French civil servant, archaeologist and writer Prosper Mérimée, who claimed that he had been inspired by a true story. Bizet and his librettists strengthened the romantic elements in Mérimée’s story by inventing Micaëla, the pure young girl in love with Don José, and by transforming a minor character with whom Carmen has a fling into her final lover, the larger-than-life torero Escamillo. Although Carmen had only lukewarm success at its premiere in 1875, it was soon being championed by composers as significant as Tchaikovsky and Brahms, and by the 1880s was being performed throughout Europe. Carmen is the second most performed opera in The Royal Opera's repertory and was the first piece performed by the Company after World War II. Carmen runs from 19 October–30 November 2015. Tickets are still available. The production is staged with the generous philanthropic support of Martin and Jane Houston and The Royal Opera House Endowment Fund.